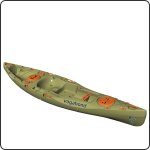 While smaller children will find this kayak large to paddle and manoeuvre, it is perfect for older children and teens. Tiny tots will enjoy sitting in the spacious tankwell. The Tankwell is a great spot for your dog – unless you’re using it for your fishing tackle. On flatwater, the Tarka Angler is fast and agile. It offers both speed and comfort for a full day out on the water. The Tarka Angler comes with two Rod Holders, which are positioned on either side of the rear 8″ Screw Hatch. These free up your hands to paddle, handle fish or to eat lunch. Deck Rails to the front and sides of the Sculpted Seat. Use these to customise your deck by attaching additional rod holders and gadgets like a fish finder, GPS device and camera. Crate-Holding Indents in the tankwell hug a crate or coolerbox to prevent it shifting. Use tiedowns, straps or bungee cord around the Multifits to secure your gear. Stay in position by attaching your anchor to the Anchor Trolley. The Tarka Angler performs on the sea in both speed, stability and manoeuvrability. Its broad hull offers superb stability on rough water. Although the Tarka Angler will get you out through the breakers and back in to shore in style, it wasn’t designed to cutback or ride tubes. Enjoy kayak fishing on rivers with small rapids and scenic flatwater sections. This kayak is not optimal for big water and large rapids. Use the 8″ Screw Hatches and Tankwell to secure gear for overnight trips. Our Stand-up Platform is a winner. It makes it easier for you to get in and out of this kayak, but also so that you can stand, stretch your legs and enjoy a height-above-water view to check out your surroundings, while you’re out on the water. We wouldn’t recommend paddling your Tarka Angler from a standing position.